FIGURE 17-6 Sequences of thymic hormones. Abbreviations: Ac, acetyl; x, unknown; B, Asp or Asn; Z, Glu or Gin. Underlined sequence represents a nuclear translocation signal. 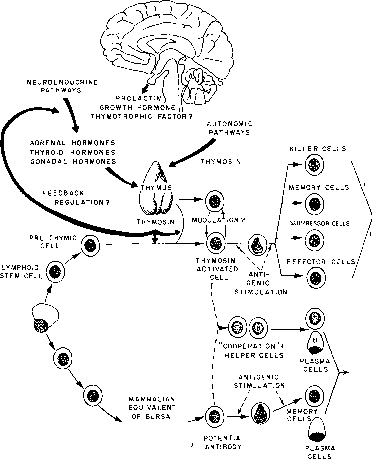 FIGURE 17-7 Hypothetical model illustrating the major interactions between the central nervous system and the neuroendocrine thymus. From Goldstein, A. L., Low, T. L. K., Thurman, G. B„ Zatz, M. M., Hall, N., Chen, J., Hu, S.-K., Naylor, P. B„ and McClure, J. E. (1981). Recent Prog. Horm. Res. 37, 369-415. Integrity of immune system & antibody production any of the primary sequences of thymosin «i. Pro-thymosin a is a highly acidic protein lacking an amino-terminal signal peptide. It contains the nuclear translocation signal TKKQKKT, which may direct its localization to the nucleus, causing it to differ from the other thymic hormones. It also appears to be phos-phorylated by casein kinase 2. Contrary to earlier indications, thymosin ai appears to be a native peptide in several tissues rather than an uncontrolled proteolytic product of prothymosin a, and the two polypeptides appear to be in separate compartments of the thymus epithelial cell, with prothymosin a in the nucleus and thymosin «j in the cytoplasm. 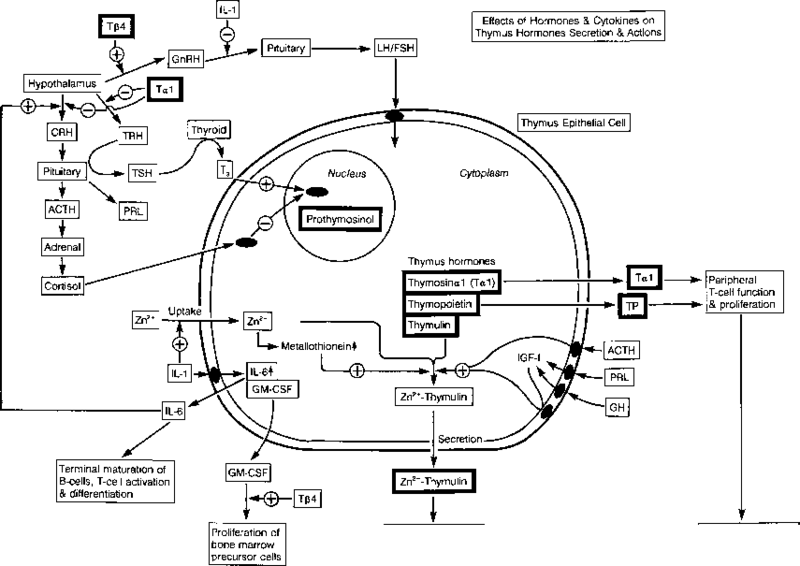 FIGURE 17-8 Effects of hormones and cytokines on thymus hormone secretion and actions. Three major thymus hormones, thymosin, thymopoietin, and thymulin, are thought to reside in the cytoplasm of the thymus epithelial cell. Some evidence suggests that prothymosin a resides in the nucleus and contains a nuclear translocation signal, TKKQKKT. 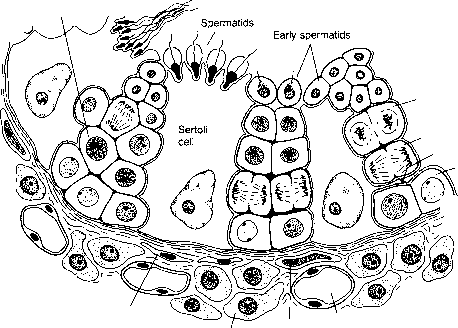 The three cytoplasmic hormones are secreted into blood circulation. Thymulin is secreted as a 1:1 complex with Zn2+ dependent upon Zn2+ uptake by the cell. This is stimulated by extracellular IL-1. Internal Zn2+ further stimulates metallothionein, which catalyzes the combination of Zn2+ with thymulin, and then secretion of the complex occurs. Zn2+-thymulin acts on IL-2 receptor-positive peripheral blood lymphocytes, causing stimulation of protein kinase C and cellular proliferation, which ensures antibody production. Similar effects are exerted by thymosin <*i (Ta^) and thymopoietin (TP), which act on peripheral T cells causing them to proliferate. The thymus interacts with the hypotha-lamo-pituitary axis, as shown in the upper left of the figure. Thymosin fit (Tfit) stimulates the release of GnRH from the hypothalamus, while thymosin <*i (Tai) inhibits the release of CRH and TRH from the hypothalamus. Interleukin 6 from the thymus epithelial cell also affects the release of hormones from the hypothalamus, stimulating the release of CRH. IL-1 inhibits the release of gonadal hormones from the anterior pituitary under the influence of GnRH. Cortisol from the adrenal is a classical involutor of certain thymus cells interacting with the cytoplasmic corticosteroid receptor and ultimate transcriptional effects. Triiodothyronine (T3), acting on a nuclear receptor, has positive effects on the thymus cell. Some thymus hormones are synthesized in other cells of the body, probably in smaller amounts than occur in the thymus cell. Thymus hormones play a major role in preserving the functioning of the immune system. Thymus function is generally thought to decline in aging, probably underlying the increasing prevalence of diseases in old age. Tfit, thymosin /34. muscle, and bovine prothrombin. Thymosin c^ has been chemically synthesized, and the product is equally active as the biological material. Thymosin ai mRNA has been translated in a wheat germ system by using antiserum to this protein. These results suggest that a larger peptide of molecular weight 16,000 is a primary translation product, which is subsequently degraded to the native hormone (molecular weight 3108). The oligodeoxynucleotide encoding thymosin «i has been synthesized, inserted into a plasmid, and cloned in E. coli.